Sixty percent of the human body is made up of water. Water is critical as it regulates body temperature, cushions and protects vital organs, and aids the digestive system. Water also transports nutrients and eliminates toxins and waste from the body. When the body is hydrated, brain cells are supplied with oxygen-laden blood that helps maintain a healthy blood pressure. Water is so very important that we cannot survive longer than one week without it. If these symptoms are not taken seriously, issues including sunken eyes, shriveling skin and rapid heartbeat can occur. Once this point is reached, dehydration becomes a medical emergency and a trip to the hospital is needed. The obvious way to avoid this serious condition is to drink fluids. In the past, it was thought that beverages high in caffeine can lead to dehydration, but Seymour says, “this is no longer the case and any liquids will help.” Encouraging your loved one to drink a full glass of water after taking medications, and avoid wearing heavy clothing such as sweaters outside on a hot day, also will help. “Eating fruits high in water is also a good tip to getting the necessary fluids one needs on a hot day,” says Torchia. 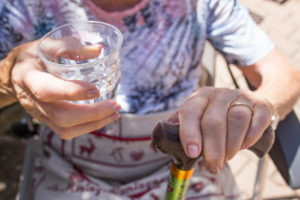 “I also encourage anyone who goes out on walks or exercises outside to always carry a water bottle with you in case the early signs occur.” She adds that sometimes family members notice confusion and attribute it to dementia when it may be dehydration. It is crucial to be certain loved ones are taking in adequate liquids. Country Meadows takes hydration seriously and has hydration stations placed in lobbies and common areas. In some levels of care, beverages are delivered to rooms in the afternoon to remind residents to keep drinking. Sugary drinks such as sports beverages, fruit juices or soda are avoided because the sugar can cause further dehydration.